So it's almost move time and my menu planning is dwindling down a little bit. I got rid of the breakfast and extra foods for now. I'm also trying to use up some leftovers in the house. Like I've had a box of orzo for forever! 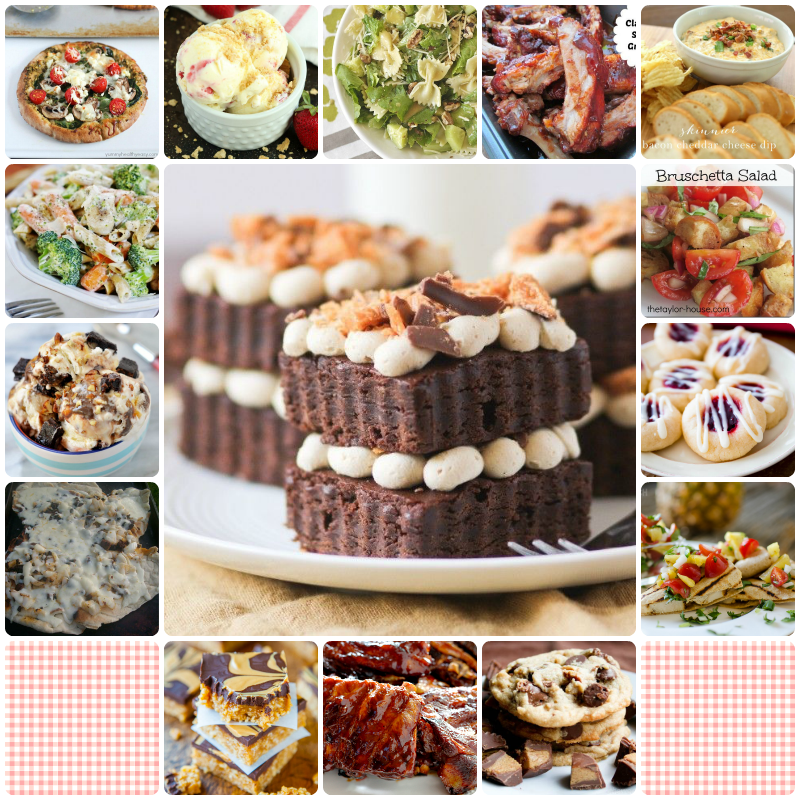 You can find the recipes for any unlinked recipes on "My Meal Plan" board on Pinterest. I got salads, lunch stuff for the kids, milk, cereal, and snacks in addition to the dinner things listed above. I didn't get Friday or Saturday stuff yet because I don't know what all we'll have in the fridge for cooking out. I have some great foodie finds this week that are making me really hungry! We had ribs last Saturday, so I am on this huge rib kick right now. It was my first time making ribs at home and they were incredible! I've also made a homemade ice cream and froyo recipe last week, so I'm also craving more of those! Not to mention just all of these other recipes look really good and make my tummy grumble even though I just devoured some homemade pizza. Quesadillas are kind of the bomb. I mean you can choose so many different flavors [cheesesteak, jalapeno popper steak, chicken, bacon, & avocado, bbq chicken & pineapple, and copycat taco bell chicken] and they are typically very easy and quick to make. What I love about this particular quesadilla recipe is that the flank steak goes into the crockpot and by dinnertime, you get this ridiculously delicious filling for the quesadillas. Unbelievably good! Yesterday was really busy! It was Group D reveal day for Secret Recipe Club and my kiddos had their field day at school. I only left during their lunchtime to go to the grocery store really fast. When I make my grocery list, I go through each recipe and write down what I need and then start crossing off what I have on hand. Then I transfer it over to another list broken up into cold/dairy, meat, box/can, and produce. I am not sharing my grocery list because I've already thrown away the one that's by recipe and I have no clue what ingredients go where! I didn't have many extras this week - just granola, rice cakes, a salad, and instant oatmeal for the kids for breakfast. It's time for Secret Recipe Club once again :) For those who haven't heard of Secret Recipe Club, it's a large group of bloggers who each month are assigned another SRC member's blog secretly, make a recipe from their blog, and post it for reveal day. It's so much fun to see who got your blog and what recipe they decided to make. If you are interested in joining, go check out this page and get put on the waiting list! This month I was assigned to Nicole's blog, hapa-tite. Her tagline is edible adventures & cultural explorations. Nicole says her family is ethnically Chinese, Cherokee, German, and American, but culturally Hawai'ian. Her blog really reflects that wealth of culture. 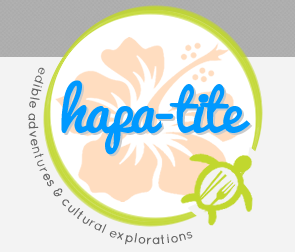 And I cannot get enough of that little Honu ("hawai’ian sea turtle") in her logo. So cute! There was Pork Souvlaki or Pai'a Sai Min which both looked mouthwateringly good and completely uncharacteristic of me to choose. And then there's the Homemade Nutella (Gianduja), Chai Chocolate Coconut Cardamom Rice Puddings, and Pistachio Dark Chocolate Toffee. I seriously almost went with the Hawai'ian Banana Bread. In the end though, I went with Nicole's Lemon Basil Pasta Salad to go with the garlic basil chicken, grilled peaches, and beer-battered broccoli bites I made one night. Nick and the kids couldn't get enough of it. My son said it was his favorite thing on the whole plate (but he's also a pastaholic like his momma, so....). I only wish that I would've done the tomato roses like Nicole did. They are so pretty! This recipe was a hit for us and I can't wait to make it again...although of course I am definitely going to have to try some of the other amazing looking recipes on hapa-tite! Not to forget that I want to do some of her bentos for next school year! I totally meant to finally announce my big news last week, but was in such a rush to get my giveaway up that I totally forgot. I am now the owner of the Secret Recipe Club!! I've been a member since October 2011 and love it. I've been hosting since April 2012 and I am continuing on with hosting my group: Group D, woo! I'm taking over for the previous owner and person who trained me to take her spot as Group D hostess when she became owner: April of Angel's Homestead. April is going to live it up road-tripping in an RV with her dear husband, so she is going to be much too busy to take care of all the things running SRC requires. Now on to some food! I used to be a Prego girl (not pregnant, but spaghetti sauce brand). It's what I grew up eating with spaghetti and it's what I used for a good few years of my adult life. Then I began searching for the perfect homemade sauce. I had a few busts...and then I found my absolute favorite recipe for spaghetti sauce of all-time: Meaty Spaghetti Sauce. It still is my favorite. Nick, on the other hand, is in love with this recipe. He thinks it's hands-down the very best spaghetti sauce he's ever had and declared I could stop searching because we've found the very best recipe for spaghetti sauce ever. Gotta love when you find a recipe that is THAT good, right?! Well, pizza/cheese/bacon dinner! This recipe is definitely a winner in my book. It has all the essential ingredients a pizza needs to have: cheese + bacon + a killer homemade crust. I don't know about y'all, but those three things mean perfection every single time. I could not get over how good the cheeses were together. I mean, of course they worked together, but just the combination....ahhhhhhh! - that was a chorus of angels right there! We have Alice [my SUV] in the shop getting something minor fixed, but it meant I was without vehicle on grocery shopping day [Monday], so we actually went out yesterday as a family grocery shopping. You would think I'd spend an outrageous amount more with 2 kids and a husband in tote, but I didn't :) They are pretty good at sticking to the list and not hungry-shopping. Fantastical Friday: Yoohoo! Big Summer Blowout! Things are going to get a leeettle bit hectic around here..we're pretty much down to the 1 month away mark of moving. It's a big move. There's a ton of stuff to do because we are transporting everything from New York to Tennessee...everything military to civilian. Is this real life? And I WAS going to do this giveaway for my 4th blogiversary on August 2nd, but I can't promise I'll remember to bring my cookbooks with me in the mess of packing up things to go to storage for 6 months, things to stay with Nick until Sept, and things to go with me and the kids in July. So that means I'm having a BIG SUMMER BLOWOUT. YOOHOO! 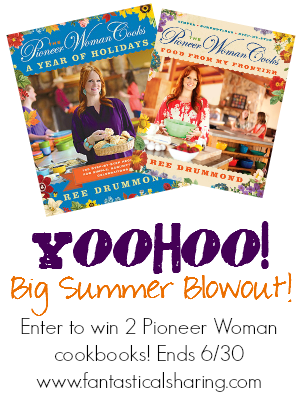 I'm giving away two of my favorite cookbooks of all-time by my favorite food blogger of all-time, The Pioneer Woman Cooks: A Year of Holidays [retails at $29.99] and The Pioneer Woman Cooks: Food From My Frontier [retails at $29.99], to one very lucky winner! You must be 18 y/o or older to enter. Begins 6/13/14 at 12:00pm EST and ends 6/30/14 at 7:00am EST. Winner will be announced during the day on 6/30/14. One winner will win two cookbooks retailing at $29.99 each (via Amazon). All entries will be verified and the number of entries received determines the odds of winning. The winner will be contacted via email and has 48 hours to claim the prize or a new winner will be drawn. This sweepstakes is in no way associated with Pioneer Woman, Food Network, Amazon, any of the social media sites used for entries, or any other entity unless specifically stated. Fantastical Sharing is not liable for any damages, lost, or stolen prizes. I have been wanting to make lasagna rolls for a very very long time. Basically since I saw them online...and that's been many many years. I am relatively new to loving spinach. I didn't start eating it until my adult life and that was because my mom didn't like it, so it never made its way to our dinner table. I love it though. It's one of my favorite green leafy foods. My kids love spinach too, so there was no doubt in my mind that they would love this recipe. I am a lover of Italian food...but surprisingly I'm not really a huge fan of lasagna. When I made my first lasagna, I found a recipe that I will eat and love. My aversion has always been to ricotta cheese and that recipe uses cottage cheese (which I loved as a kid, but don't like as an adult)...but you cannot even tell it's cottage cheese and it's just amazing! My husband is also iffy on lasagna. He, like me, will eat it every once in a while. Maybe like once a year. I made the recipe using cottage cheese and he was extremely disgusted, as he is with anything that contains anything remotely like sour cream, ranch dressing, or mayonnaise. But he tried it anyways and it turns out that he ALSO loves that recipe for lasagna...so when I made these lasagna rolls, I subbed out the ricotta for cottage cheese. We also really like meat with lasagna and used ground beef in this one, but you could use ground turkey for a healthier alternative. Maybe a mix of turkey and Italian sausage. Either way it's a fantastic dish and pretty simple to put together. I am going to have a really unpopular opinion right now. I'm not a big donut fan. Again, cake donuts...homemade donuts - HECK YES! I gobble them up. These baked chocolate donuts with streusel topping are kind of cake-like. They are unbelievably good. The buttery toffee goodness of the streusel on top...oh my goodness! YES! Y'all have got to try these! Fantastical Sharing to the rescue! There was an orphan for today's Group B reveal for the Secret Recipe Club and I am sharing a recipe from the orphaned blog, so they aren't left out :) What is the Secret Recipe Club? It's a group of food bloggers who are split into four groups. 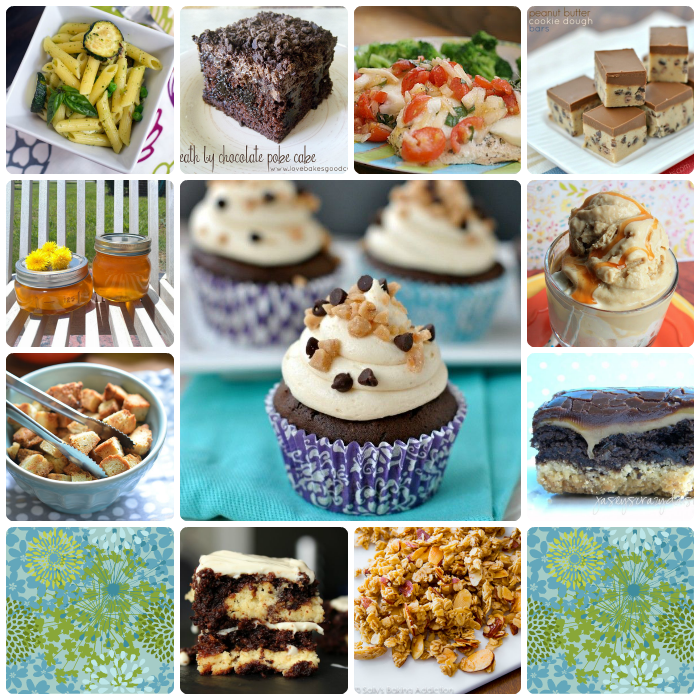 Each month, we are assigned a blog from our group secretly and we pick a recipe to make. We photograph it and write up a blog post and all of the group posts on one designated Monday in the month. For more on SRC, be sure to visit the site. Group B's orphan was Corina of Searching for Spice. Corina is a mom who likes to experiment in the kitchen, but doesn't like to spend ALL her time consumed in the kitchen making food. I totally get that. I love making new foods too, but I also don't like being tied down in my kitchen all day long. I like to make something, enjoy it, and hope that the cleaning fairy comes by, so my mess disappears ;) Don't we all do that?! Corina's blog is a way for her to document her favorite recipes that she's made and she loves to use and discover new spices (hence the blog name!). Corina has a bunch of great looking recipes on her blog, but I was craving something sweet to go with my lunch and needed to make something that used ingredients I had on hand. I decided upon the Apple & Cinnamon Crumble. I had some green apples in my fridge and for some odd reason, I have a surplus of cinnamon in my pantry, so it seemed like destiny here. I adjusted the measurements ever-so-slightly because I only had 2 apples instead of 3 and Corina noted that sour apples may call for a teeny bit more sugar. I used brown sugar because I felt like having more of the richness of the brown sugar and I added a pinch of nutmeg on top, just because. A little extra spice is nice! 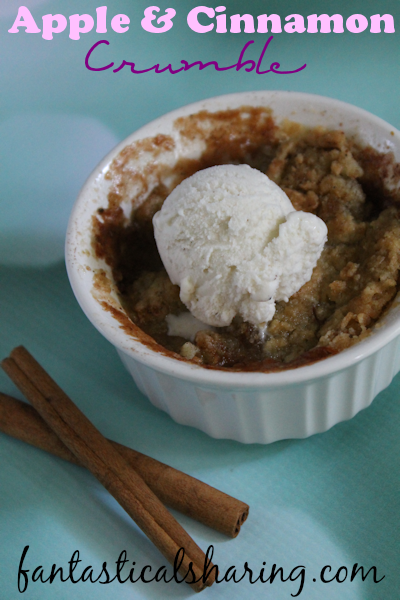 These crumbles were cute, tart, and ahhh, exactly what I needed! So glad I had the opportunity to make something from Corina's blog! Sorry for the lack of posting here on the blog...I'm working on scheduling a few posts for the upcoming weeks to remedy this and in the mean time, will be announcing what I mentioned in last week's post, hopefully next week. I'm really excited about it. We're just finishing up the last few things and then the announcement can go public! I'm not doing a round up this week, but follow me on Pinterest to see some of my recent foodie finds - they are pretty amazing! I'm not sure if it's just that I really love food or what, but I get so excited about the food we're going to eat in the next week. I can't really pick which day I'm most excited about or which recipe. EAT ALL THE NOMS.